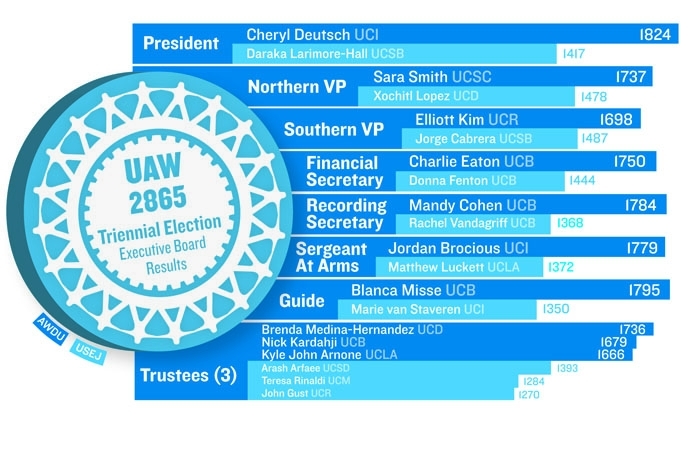 A little more than five months after a contentious contract ratification vote left some calling for change in a union representing academic student employees throughout the UC, a reform caucus swept all executive board positions and about half the seats on a leadership council, concluding the most contested election and vote count in the union's history. The election ended Sunday, with Academic Workers for a Democratic Union, a reform caucus within United Auto Workers Local 2865 - which represents more than 12,000 graduate student instructors, readers and tutors - winning all 10 executive board positions and 45 of the 80 seats on the union's Joint Council. The Joint Council is a governing body of the union comprised of head stewards, recording secretaries and unit chairs from each campus as well as the union's 10-member executive board. The next meeting of the council - which is slated for July - will be the first with the newly elected leaders. "It's been a relief," said president-elect Cheryl Deutsch. "More than the actual campaigning and the election, just the vote count process itself was exhausting and trying. It's really exciting to move forward and build off the momentum that not only this movement has created, but especially the very difficult vote process really strengthened us as a group." Incumbent union president Daraka Larimore-Hall lost the election to Deutsch, a graduate student and union steward at UC Irvine, who gained 56 percent of the votes cast. Overall, AWDU won just over 55 percent of the votes cast statewide. Deutsch said institutional changes for the union will be process-oriented, such as including more statewide members in decision-making processes, which she said have typically been limited to executive positions. Prior to the election, United for Social and Economic Justice, a slate affiliated with the incumbent leadership, held eight of the 10 executive board positions and a majority of the seats on the Joint Council. "This is a strong and powerful organization that can certainly roll with a change in leadership, so long as members of AWDU challenge their leaders to stop the tactics of intimidation, misinformation, lying and personal character assassination that they led with in the campaign," Larimore-Hall said. Tensions were running high prior to the election, following a contentious bargaining session with the UC and a contract ratification vote late last semester that resulted in increasing levels of partisanship and divisiveness in the union as members debated its structure and direction. Controversy continued to grow, with accusations and allegations of voting fraud from both slates and negative, aggressive campaigning. The vote count itself faced setbacks from challenges to many ballots from both slates and was halted in a vote by the union Elections Committee April 31. With a little less than half the votes uncounted, the decision was met with outcry and mobilization of members from both slates, including "sit-downs" in union offices by AWDU members and letters from both slates demanding that the votes be counted. Counting resumed last Thursday with additional policies - such as the involvement of a third-party mediator - in place to avoid problems that had hindered the process. While AWDU swept all executive board positions, results for elected campus leaders were mixed and varied by campus. At UC Berkeley, all campus positions went to AWDU, but at campuses such as UC San Diego and UC Santa Barbara, all campus leadership positions went to members of USEJ. The fact that this year's election was so largely contested made both slates aggressively solicit votes, using different outreach methods, rather than relying on previous one-on-one methods, said Megan Wachspress, a UC Berkeley graduate student and campus head steward for the union. Voter turnout in this year's election increased to about 3,400 votes as opposed to about 300 in the last tri-annual election in 2008, according to Charlie Eaton, a UC Berkeley graduate student and union financial secretary-elect. According to Wachspress, mobilization of students in this year's election made a great difference in voter turnout, as opposed to the 2008 election, which was relatively uncontested. The union's last widely contested election was in 2005, in which about 1,500 people voted. "There have been individuals that have been working very hard to change the way union operates," she said. "The change is that it became unified in statewide caucus, as opposed to before when it had been isolated on various campuses. It inspired a response from the incumbent leadership that made them realize that they would have to actively campaign and solicit votes." Though the election has been certified and the elections committee decided to "count all of the ballots where voter intent was clear to all sides rather than resolve the challenges and objections," the issue of the challenged ballots may not be fully settled, according to a report by the committee. According to the report, making a decision on the challenges is "beyond the expertise of the Elections Committee," and they should be resolved through the process outlined in UAW Local 2865's bylaws, the UAW Constitution and the UAW Election Guide. "At the elections committee's recommendation, the opposing slates participated in mediation on May 5 and 6, 2011 in an attempt to reduce the number of potential challenges," the report reads. "The mediation failed." According to Eaton, because the vote count was completed and the election was certified, the elections committee has rejected all challenges or found that they would not change the outcome of the election. He added that under the union's bylaws, constitution and elections guide, the decision on challenges can be appealed to the next statewide membership meeting on May 21. Any such decision made at the statewide membership meeting can then be appealed to the executive board of UAW International and then to the internal Public Review Board of UAW, according to Eaton. "This process would take several months and I would be shocked if any of these bodies overturned the election results at (UC) Berkeley or for the (executive board)," he said in an email. The union is now calling for a statewide meeting on May 21 in Berkeley to discuss its future plans.